At present, more than 2.5 billion people worldwide lack access to modern sources of energy. Since we know expanding the role of women in the economy can speed up development, help combat poverty and reduce inequalities (OECD, 2010b), why not put the two together? At Hivos, we want to contribute to gender equality and women’s empowerment and increase access to sustainable energy on a global scale (SDGs 5 and 7). That is why in 2014, ENERGIA (our partner in the Green & Inclusive Energy strategic partnership program) started the Women’s Economic Empowerment (WEE) program in Indonesia, Kenya, Nepal, Nigeria, Senegal, Tanzania and Uganda together with five partners. The goal was to include women in the renewable energy sector as entrepreneurs to increase energy access in their communities. 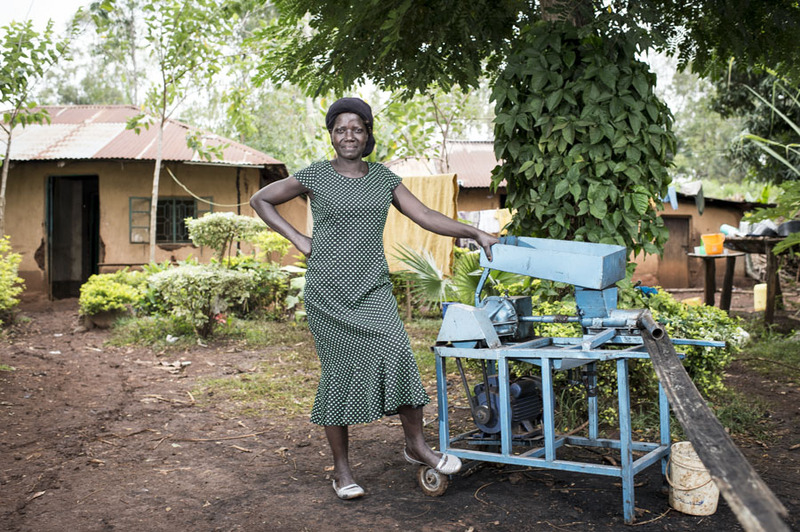 Four years down the line, the new report, “Supporting last-mile women energy entrepreneurs: what works and what does not,” offers a unique self-reflection. It not only shares the main results of the past four years, but also sets out the most promising strategies and best practices, and shares both challenges and lessons learned. One overall result we’re proud to share is that the program has already had great positive impact on thousands of people’s lives. Felicia (46), a science teacher, heard about “pico-solar products” when a business associate from Solar Sister, one of ENERGIA’s partners, came to demonstrate clean energy products at her school. Pico solar systems are much smaller and cheaper than traditional solar systems, but provide enough power to charge simple gadgets. She was surprised to learn that these reasonably priced solar lamps could eliminate the need for kerosene and batteries. After seeing how well a small (USD 8) solar lamp worked, she bought a larger solar lamp, signed up to be a Solar Sister entrepreneur and has not looked back. She and her teenage daughter visit schools, churches, cooperatives, hospitals and homes to promote solar products and drum up business. Damaris is a young widow with three children who started installing improved cookstoves in people’s homes in 2010. Although this gave her an additional income of USD 12 to 16, she could not meet her household’s financial needs. A turning point came in 2016 when she learned about Practical Action’s Women in Energy Enterprises in Kenya (WEEK) project. At their training, she was inspired to expand her business and sell bio-briquettes, an organic substitute for coal and charcoal. This was a game changer for Damaris: “On average, I now make between KES 30,000 and KES 50,000 (USD 250 to 450) every month.” These days, Damaris’ energy business keeps her so occupied that she has handed over her shop and other businesses to her youngest son. Niru lives in a small village in Nepal where cultural barriers hinder women from earning a living on their own. The 2015 earthquake hit the poorest hardest and further exacerbated inequalities between women and men. Niru showed how barriers can be overcome when values drive the change. After 13 years in the cookstove business building on-site mud stoves, she joined ENERGIA’s training for female entrepreneurs and changed the course of her life. Niru set up shop and started selling improved biomass cookstoves that reduce indoor air pollution by 80 percent and fuel usage by 50 percent. Currently, she is a role model in her community. In the first nine months of 2018, she has sold more than 3,000 stoves. Niru’s distribution chain comprises 22 women who sell the stoves in different villages in Sindhuli. Of course not all female entrepreneurs we’ve worked with have such successful stories. So we must continue learning how to give them access to the right tools, information and network so they can become change makers in their communities. After four years, we know better what works and what does not. For example, there are certain factors that influence the success rate for recruiting women and determine who is likely to become a successful entrepreneur. We also know that legal, policy and cultural barriers need to be addressed to give women entrepreneurs access to finance. That’s why we’ve published this report, so its lessons can be an inspiration to both energy and gender policymakers and practitioners. It offers a practical and operational roadmap for developing women’s enterprises in the renewable energy sector. Curious about what is in the report? Below are five main takeaways. It’s important for female entrepreneurs to work in an “enabling environment”. We found that if we want to increase women’s engagement in the energy sector, it’s important to help create an environment that facilitates entrepreneurship. One with industry standards and certification, conducive fiscal policies, and easy access to information. It is essential to align your efforts with national priorities. For example, our WEE project in Nepal directly contributed to the government’s “Clean Cooking and Lighting Solutions for All by 2017” national campaign. This made it a lot easier to work with local government institutions and agencies that could help us raise awareness of issues such as indoor air pollution and solar energy. Providing finance alone, particularly in the small amounts typically associated with microcredit, is insufficient for women micro-entrepreneurs to make long-term business investments. We learned to provide complementary services to enable their sustained business growth, such as access to technology, business skills training, and individual tailor-made mentoring. Collaborating with a network of different stakeholders is essential to women’s enterprise development. The key partners we worked with included the entrepreneurs themselves, renewable energy product suppliers, banks, MFIs, cooperatives and village savings, loan associations, national government agencies and local authorities. When women entrepreneurs grow their business, the dynamics in the household and the family can change. That’s why engaging family members including men is critical to women’s enterprise development efforts. Sometimes this means (partially) involving the husbands. To find out more about the best practices and failed strategies that emerged from our own experience, visit ENERGIA's website or download the full report here. *This news article was originally published on Hivos website.